These electro-magnetic level gauges packed in "kit" can be obtained in the desired "L" length simply by cutting the control rod by means of a common pipe - cutter and inserting under pressure the float into the cut point. The control rod can switch over the signal from 1 or 2 Reed contacts in succession (simple or switch - over contact). The float does not carry magnets (therefore the level may be used also in presence of dirty liquids or of ferrous particles). Notes: the level of 10.800 / 10.810 and 10.830 series are usually supplied with closed contacts in case of absence of liquid. If you need to have them with open contacts, you have to specify "A" near the number of the chosen scheme. The 10.820 series has a head carrying two control rods and two floats. Each control rod can switch over the signal from 1 or 2 Reeds (with a simple or switchover contact). For each control rod, you may choose the most suitable scheme. Therefore, each head can contain from 2 to 4 Reeds. As a rule, the levels are supplied along with the control rod of minimum level (1), which closes the contacts in the absence of liquid and along with the control rod of maximum level (2) which closes in the presence of liquid. 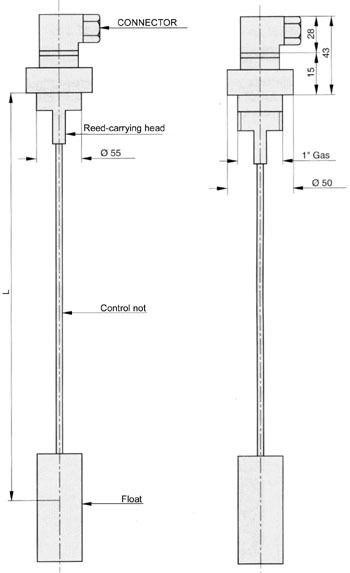 If you wish to receive the control rod arranged in a different way, you will have to specify in your request. For lenghts higler than 500 mm. and for tanks having a strong turbulence, is advised the reinforced type of levels, that is the 10.800 and the 10.820 R type. This level, that work sideways, is suitable for various applications. Like the 10.800 series, it may as well be used to control the minimum or maximum level as to control the minimum too empty or maximum and overflowing level. 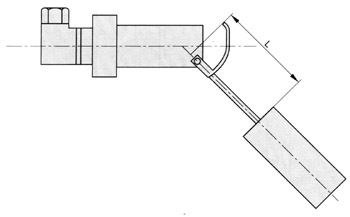 Unlike the 10.800 series, the distance between the 1st and the 2nd signal is not fixed, but as an angular value increasing progressively to the lenght of the pipe. 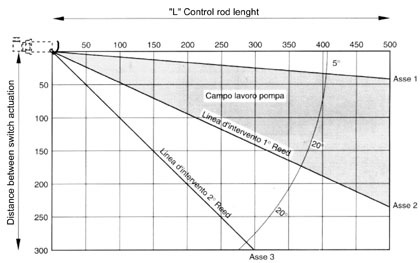 This allow the designer wide possibilities of choise, in fact, if the "L" lenght varies, the points of interventions of the 1st and 2nd reed contact vary too (please read on the axis) 1 and 2.